When working with extremely large or small numbers, you can save on time and space — and make calculations easier — by using scientific notation. As you will see, it uses both decimals and exponents to represent these numbers in a kind of shorthand. Scientific notation uses powers of ten expressed as exponents, so you need a little background before you can jump in. Numbers starting with a 1 and followed by only 0s (such 10, 100, 1,000, 10,000, and so forth) are called powers of ten, and they’re easy to represent as exponents. Powers of ten are the result of multiplying 10 times itself any number of times. To represent a number that’s a power of 10 as an exponential number, count the zeros and raise 10 to that exponent. For example, 1,000 has three zeros, so 1,000 = 103 (103 means to take 10 times itself three times, so it equals 10 10 10). 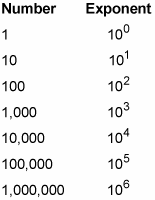 The following list shows some powers of ten expressed as exponents. As you can see, a number of this size is practically unmanageable. You can save yourself some trouble and write 10100. Negative powers of 10 always have one fewer 0 between the 1 and the decimal point than the power indicates. In this example, notice that 10–7 has six 0s between the 1 and the decimal point. As you can see, this decimal is easy to work with in its exponential form but almost impossible to read otherwise.